Do you love to fish? Is your passion spending time out on the water with a buddy, spouse, father, son, daughter, or even alone? If you live near Ketchikan, or are planning an upcoming trip to the area, schedule a custom fishing excursion with Anglers Adventures. 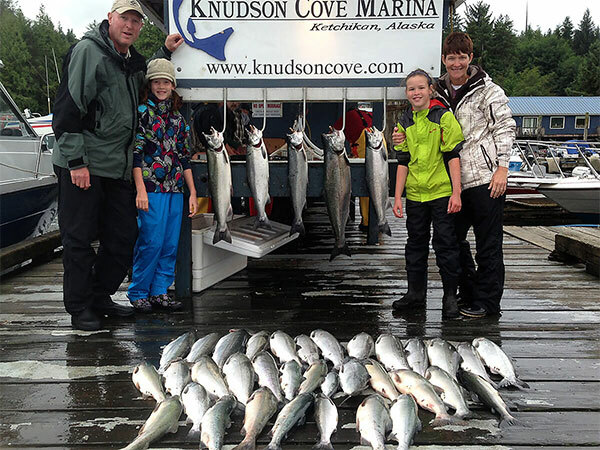 We offer half day, full day, and multi-day charters in the breathtaking Southeast Alaska area. Anglers is locally owned and operated by a year-round resident, so you will be sure to have a unique experience that cannot be matched. Our private fishing charters are perfect for a novice or an experienced fisherman and we welcome children and even families. We target salmon, halibut, rockfish, and black and gray cod on our excursions and will work to make sure that your experience is exactly what you are looking for. We set sail from the Knudson Cove, which is close to some of the best fishing grounds but just a short drive away from the busy (and sometimes crowded) waters of downtown Ketchikan. In addition to being able to catch some of the best fish in the area, you will also get a view of the incredible wildlife in the area on one of our excursions. When you head out with Anglers Adventures, you will be in great hands. Brian Ringeisen is the Captain and brings 26 years of experience with guided fishing tours. Brian values service and will work to be sure that your experience is the best. He knows the area, and you will benefit from that local perspective. You can also count on being safe on your journey. Brian was a U.S. Coast Guard licensed Captain for 25 years and he is CPR and First Aid Certified, fully licensed and insured. To book an excursion with Anglers Adventures, all you have to do is call Brian directly at (907) 254-0880. He can go over pricing and options for scheduling. All reservations require a non-refundable 50% deposit, at the time of booking. The remainder of your fee will be due upon your arrival. And, if something happens and you need to cancel your reservation, the deposit amount can be reapplied to a future booking within one year of your cancellation date. A half day charter (4 hours) is $175/person and a full day (8-10 hours) is $350. This includes all gear you will need (including rain gear), bait, tackle, lures, drinks and snacks as well as much instruction as you need to make the trip enjoyable.